Summary: Emmanuel Saffa Abulai is an attorney, a newspaper publisher, and an activist. Despite personal and professional attacks from the government and some individuals, he continues to represent besieged clients, push for laws that are more just, and advocate for policies that protect disadvantaged citizens of Sierra Leone. 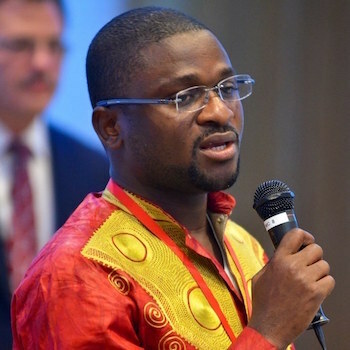 Profile: Emmanuel Saffa Abdulai is a courageous human rights lawyer, the publisher of Sierra Leone’s News Watch newspaper, and one of the founders of the Renaissance Movement of Sierra Leone, made up of youth who want to improve their country. Abdulai is also the director of the Society for Democratic Initiatives (SDI), a non-partisan and not-for-profit organization that provides legal representation for activists, journalists, and political victims in Sierra Leone. Through SDI, Abdulai has helped bail out activists who have been imprisoned across the country. These activists have included journalists from the Sierra Leone Association of Journalists and representatives of the Mahlen Land Owners Association. “I have come to the rescue of many citizens who have been arrested for exercising their constitutional rights,” says Abdulai. In early 2017, he was one of the leading lawyers who stood up against the unlawful arrest and detention of Theresa Mbomaya, a young woman who was arrested for posting on social media against the hike in price of petroleum products in Sierra Leone. Abdulai was slandered by his enemies as being in an inappropriate relationship with Mbomaya, even though he’d never met her. Abdulai also participated in freeing David Tam-Bayoh, a veteran journalist who’d been arrested for his criticism of the ruling government. Abdulai’s activism doesn’t stop with representing clients. He has contributed to the passage of the Freedom of Information Bill of 2013, the sexual offences Act of 2013, the devolution of Estates Act, the Matrimonial Causes Bill, and the registration of customary marriages. He has also worked on the Mines and Mineral Act and has helped draft the Extractive Industry and Transparency Law; the latter is expected to come into force soon. Currently, Abdulai is looking at the issue of “land grabbing”, especially by multinational corporations in places such as Pujehun in the south and Bombali in the north. He’s monitoring how people’s lives are affected so he can best determine how he can help them negotiate with the corporations to ensure that their human rights are not violated.